Ben Robinson/GoBuccs.com Covington’s Lillian Hamilton goes up for a kill against Bethel. The Edison State volleyball continues play in the Owens tournament today. The Chargers took a 4-0 record into the tournament after beating Clark State 25-14, 25-5, 25-20. Reagan Morrett had seven kills and five blocks, while Noel Ufferman had six kills and 13 assists. Vanessa Winner had six kills and 15 digs and Miranda Hickey added six kills, seven blocks and three aces. Whitney Pleiman served two aces and led the defense with 25 digs. GREENVILLE — The Piqua volleyball team dropped to 0-4 with a loss to Greenville. Tylah Yeomans had eight digs, six assists and 14 kills, while Audrey Poling had 12 assists. Danielle Widney had three blocks, while Haleigh Beougher had three kills. SIDNEY — The Lehman Catholic volleyball team lost to Marion Elgin 15-25, 30-28, 25-22, 25-19. Olivia Lucia had 21 kills, 25 digs and five blocks; while Reese Geise had 10 kills and 16 digs. Alexis Snipes dished out 41 assists and Lauren McFarland had 20 digs. Lehman will host the Lehman Catholic Invitational Saturday. COVINGTON – After opening the season against three of the better teams in the area, the Covington Lady Buccs were looking for their first win of the young season against rival Bethel in the Cross County Conference opener on Thursday. Unfortunately, an improved Bethel team combined with untimely mistakes by the Lady Buccs led to a 25-13, 25-20, 26-24 loss for the Buccs. For Covington, Lillian Hamilton led the way with 16 kills and a solo block, while Ellery Reck had 15 assists and two kills. Makenzee Maschino had eight assists, one kill and one ace, while Alyssa Kimmel had four kills and one ace. Makenna Gostomsky had four kills and Olivia Mohler added two. Maci White served two aces and Tori Quinter added one. The Covington JVs won 13-25, 25-20, 26-24. Covington plays at Ansonia Tuesday. CASSTOWN — Miami East improved to 3-3 on the season and kept its Cross County Conference winning streak going at 2-0 this season with a 25-7, 25-18, 25-8 sweep of Ansonia Thursday. Lydia Conley had eight kills and two blocks, Nichole Hood had eight kills, an ace and 12 digs and Delaney Bourelle had six kills, an ace and a block to lead the Vikings. Sophie Jacomet added five kills, two aces and 16 digs, Ashlyn Monnin had four kills, an ace and a dig, Macie Schaffner had 17 assists, two aces and five digs, Gabrielle Hawkins had two assists and 34 digs, Gretchen Frock had six assists and Lauren Fisher had three digs. 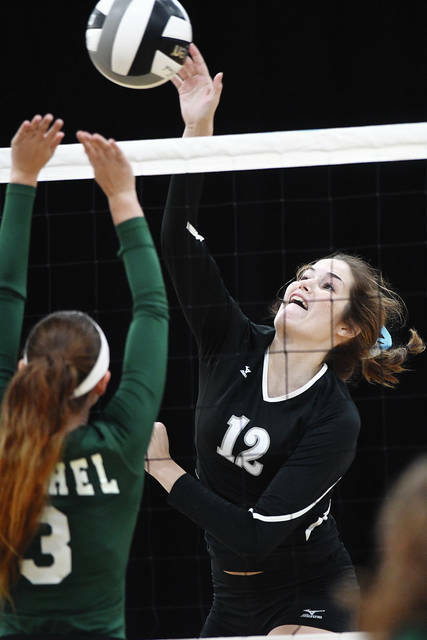 RUSSIA — Russia earned another five-set Shelby County Athletic League win on Thursday. The Raiders won the fifth game 15-11 to beat Anna 3-2 at Claire C. Naveau Gymnasium. Anna won the first set 25-17, but Russia won the second 25-23 and third 25-16. The Rockets won the fourth 25-20 to force the fifth game. Jenna Cordonnier set a school record with 56 assists. The previous record was 52 and held by Kristin Drees. Ashley Scott led the Raiders with 25 kills and had 18 digs. Laurissa Polling had 17 kills, nine digs and six blocks. Jess York had eight kills, Morgan Wenrick had five kills and Kendall Monnin had a team-high 27 digs. Cordonnier also had 15 digs and three blocks. HOUSTON — The Houston volleyball team lost to Fort Loramie 25-10, 25-10, 25-18 Thursday in SCAL action. Allisen Foster had three kills for Houston while Alyssa Kemp, Catryn Mohler, and Mariah Booher each had two. Kemp had nine assists, Hayden Riesenbeck had five digs and two blocks and Hannah Bixler and Olivia Bowser each had 10 digs. https://www.dailycall.com/wp-content/uploads/sites/30/2018/08/web1_lillian-hamilton.jpgBen Robinson/GoBuccs.com Covington’s Lillian Hamilton goes up for a kill against Bethel.